Kayaking on the Grand River – Paris, Ontario, originally uploaded by Mic2006. An unseasonably warm day – early March found JC and I visiting Southern Ontario on a search for abandoned gypsum mines. Where both the Grand River and the Nith River meet there is the quaint though somewhat aged town of Paris. It has the appearance of having been passed by progress, there are brick and barn board sided buildings in the downtown – somewhat neglected, but full of character. Large mills had once tapped the water power and the mining of plaster of Paris leaves a fascinating terrain of forgotten rail embankments, inexplicable hollows and gullies along the river bank, weirs and beaches where barges once loaded up the chalky material from underground and of course decayed and vine choked foundations. 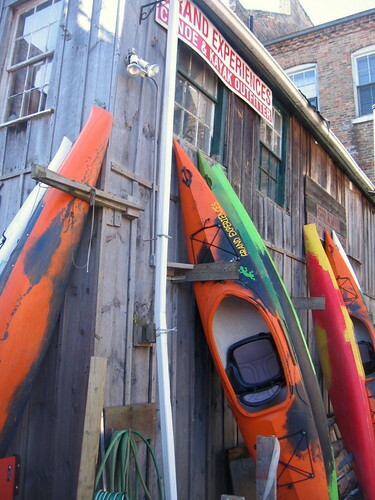 I was inspired to photograph this backstreet business, ‘The Grand River Experience’ it appears that they offer canoe and kayak rental as well as tours down the river; I believe it was on their website that I had my first glimpse of a riverside gypsum mine – supposedly one of many that are around there. As you might have guessed, there is a connection between ‘plaster of Paris’ and the coincidence of this calcium sulfate material being mined from a conglomerate that underlies the area. It is said that the gypsum comes from Silurian age lenticular deposits on the south east flank of the Algonquin Arch. Devil’s Cave is one example of a local feature where running water has dissolved away the gypsum and having washed the conglomerate out, there are small cavities lived in by a colony of beavers and decorated by spectacular white speleothems and flowstone. Having now visited this area several times and followed apparently sure leads, both JC and I are somewhat disillusioned as to the prospects of finding open gypsum adits – though a cave is far preferred. Everything seems blocked up real well (with the exception of a single adit along the river bank downriver from the town). Crossed shovel and pick symbols on a map (available on the internet) generally leads you to a spot where you’ll find an undercut that is pretty much buried in countless tons of soil. 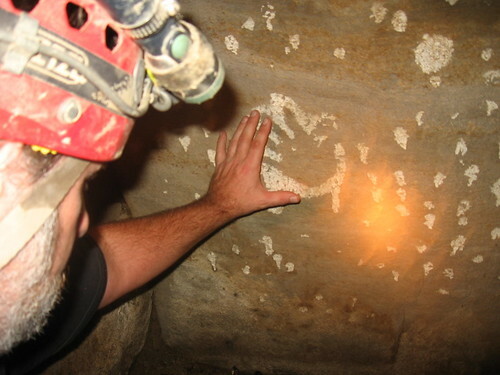 Having long been fascinated by industrial archeology, urban exploration and various forgotten tunnel explorations I’d like to know of where there are old gypsum mines around Paris where an interested person can visit and actually go underground? 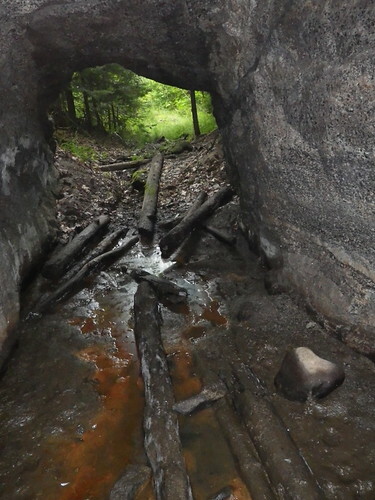 Abandoned Mine Near Niagara Falls – Ontario, originally uploaded by Mic2006. Leaded paint rock art circa 1970. Do you suppose the artist was trying to express his inner soul? will this still be here a thousand years from now and what will they surmise of primitive Ontarions? I found this unique piece of primitive graffiti in an abandoned Mine near Niagara Falls – this at the edge of a pool of water that stretched on into cavernous darkness. All through the water there are great hand-cut wooden beams and remnants of the previous mining operation and a deflated plastic raft that had once been used to venture deeper in. From past experience this would be the best way to do it as the mud is really treacherous. Here is another urban exploration in Niagara Falls of a slightly more daring nature. Mine in the Queenstone area – niagara (for building rock), originally uploaded by Mic2006. There’s a crevice that cuts under a cliff face. It leads to an underground lake that just goes on and on. Dan and I spent about two hours underground wandering waist deep in water. I am thinking that the mine is somewhere between 100 and 170 years old. Back in the 1820′s and 30′s there was a serious demand for building stone in Southern Ontario; Whirlpool Sandstone was one of the most valued materials. It was extracted from a layer just above the Queenstone shale. Near Belfountain you can see this rock at the base of Church’s Falls. See the chapter on Belfountain on page 69 of my book “Rockwatching; Adventures Above and Below Ontario” The rock that came from there was a maroon color and was used to build Queen’s Park and various buildings at University of Toronto. Down here in the more southerly areas of the escarpment the Whirlpool Sandstone seems a lot higher on the escarpment than it is further to the north. It is also more varied in color and I am told that it is possible to find azurite and malachite in chert pockets in that rock. Anyway the construction of the Welland Canal generated a great deal of demand for building stone as did the increasing size of the urban structures around the “Golden Horseshoe.” Finally around 1900 the skyscraper came into being. The strength of the modern skyscraper comes not from its rigid outer shell but from its internal steel girder skeleton. This change in design meant that standard construction stones suddenly lost their market and materials such as Italian and Indian marbles started showing up. They formed a thin veneer as did materials like glass, labradorite and granite. they were in no way responsible for the buildings structural integrity. Sandstone had seen its day and the mines closed shortly thereafter. Some years back year Jeff Mirza and I traveled up to Belfountain to see if we could find our way into one of these underground tunnel systems. Apparently there are several deep passages above the hairpin bend as you wind down from Belfountain into the Credit Valley. 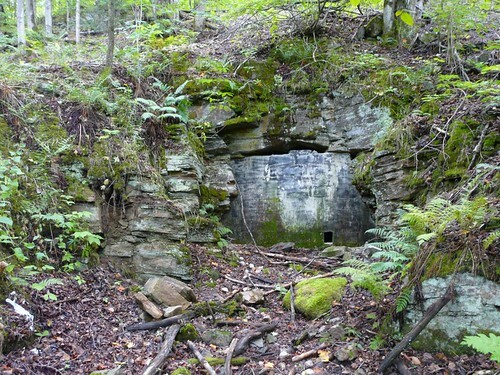 Jeff had even seen a picture of a shaft in the forest with a ladder leading down into the mines. After a day of trudging along the hillsides we came to the conclusion that the entrances had all been blasted shut. It was not the case here. The tunnels lie wide open. It was as much a historical exploration as it was a geological one. The rooms were quite low though generally very wide and initially lit by small shafts that cut up to a brambly plateau above. The vegetation was so thick that it was almost impossible to progress on the surface, nevertheless, the shafts of light on the underground lake were really picturesque. At times high banks of rubble rose out of the water and it was necessary to slither along on our bellies. In places deeper into the mine calcite deposition had made a hard, translucent shell across the top of these banks and we had to be careful so as not to damage the profuse clusters of soda straws that were forming on the roof. The bats seemed quite perturbed by our arrival in their world and somebody was cheeping angrily from up a crack in the roof. On several occasions they fluttered by and I could just catch glimpses of their chaotic flight. I was surprised by the extent of speleothem formation in the mine. I had believed that under good conditions soda straws could grow at about an inch every hundred years though in remembrance of a winter excursion Jeff and I had done up a storm sewer in Hamilton a few years back, that one inch can be quite drastically stretched. As we waded through the lake there were tunnels that branched off in every direction, the air seemed dead and the steam that rose from our coveralls clung to us. it made photography quite difficult. The water was so still and clear in one spot that I was surprised by the ripples when I crawled right into a pool. We continued on along a mound that was just beneath the surface. Dan wandered off to the side into the deeper water and suddenly found himself hip high in really treacherous mud. I had a similar experience moments later and we decided that further exploration would have to be done with an air matress. Up ahead it sounded like a heavy rainstorm and I think that there must have been a spot where the water was pouring in. Silver Crater Mine – Bancroft, originally uploaded by Mic2006. I paid my $2 at the house of the landowner whose property I had to cross and then headed off into the woods. I’d heard that the path to the mine was about 4 miles long (it was not), but possibly longer, and the route was signposted (it was not- or should I say, it was in places). 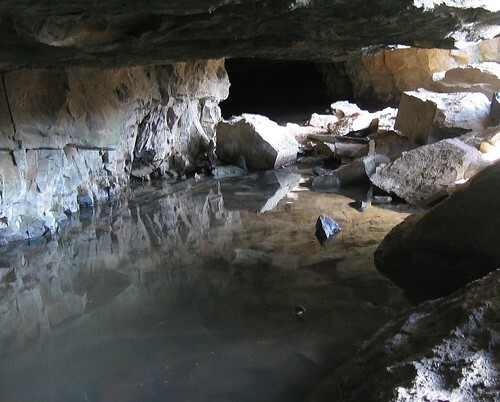 The attraction at the Silver Crater Mine is a pit and adit that are rich in Betafite crystals. I found a lump of calcite with the top of one such crystal sticking out. It looks like the dull grey top of an octahedron. The adit burrows through a granular calcite which in my opinion does not make for a well-supported roof. So my advice about the adit is to stay out. I went in about 10 feet before coming to this decision. Aside from radioactive betafite, there is also apatite (turned red by radiation), large books of biotite and horneblende. P1020263, originally uploaded by Mic2006. I just got back from Cobalt last night, it was a long drive – 6 hours. While in Cobalt I took an abandoned mine tour. Its a service offered by the local museum – well worth doing if you like that kind of thing. 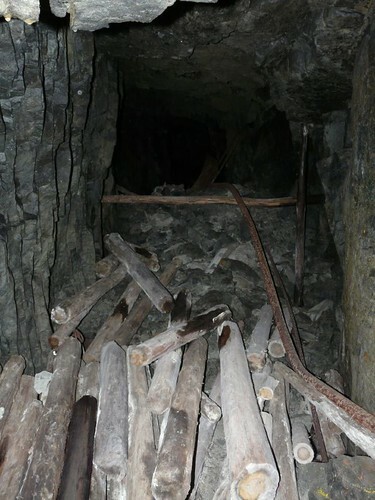 This here is one of the tunnels in the old Colonial Mine. There are over 27 kilometers of passage – stretching as far as Lake Temiskaming I am told. Beneath the level we were at the tunnels are all flooded. Shafts lead up and down – but not anywhere near where we were – it was quite sanitized and safe for the average visitor. Tunnels spidered along through dense black rock following the calcite veins that had led to silver. Outside every mine there were big piles of scree, it suggested something of the extent of the tunnels within. P1010863, originally uploaded by Mic2006. I noticed this blocked up mine and an interesting scar above it when I was travelling along Old Mumford Road after an unsucessful attempt to find the Tripp Nu-age mine. I thought that I had found a new area for collecting rocks as there was plenty of purple fluorite in the crevice above but this turned out to be the Dwyer Fluorite Mine. It looked like there might be some radioactives in the seam with the fluorite but I could’nt be sure.